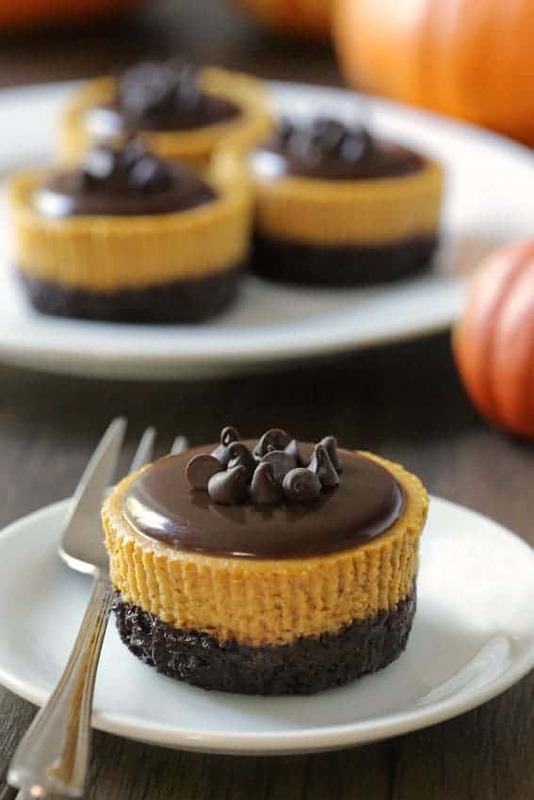 These gluten-free mini pumpkin cheesecakes are the perfect make-ahead Thanksgiving dessert and can also be made with all-purpose flour. Thanksgiving is by far my favorite holiday. I love Christmas but it’s way too stressful! Maybe it’s different in your family but in mine, it seems as though the entire month of December is filled with Christmas stress. And sometimes a little too much drama! Not only that, but I much prefer Thanksgiving food. I made these gluten-free mini pumpkin cheesecakes back in September as a trial run and have been enjoying one a week from the freezer. For those of you who want to get as much of their Thanksgiving preparation done in advance as possible, these are perfect! Freeze them in their wrappers, unwrap and pour some ganache on top before serving. I used to try to time everything so that all the food, including dessert, would be piping hot and fresh from the oven. Luckily, I’ve seen the errors in my ways and now prepare as much as possible in advance! I adapted the chocolate cookie crust from my mini peanut butter cheesecakes. You can use all-purpose flour, a gluten-free baking flour mix that’s a 1-to-1 sub for all-purpose flour (like this one, or buckwheat flour. If you use buckwheat flour, the crust will be very bubbly and even soupy looking when baking. It’s the weirdest thing – but it works out in the end! The three different versions are all equally delicious so use whatever works best for you. If you don’t like the pumpkin and chocolate combination, the almond flour based crust in these gluten-free mini cheesecakes would be perfect! I’d leave out the lemon zest and add about a teaspoon of cinnamon and maybe even a little ginger. And as for the pumpkin cheesecake – it’s quite heavily spiced, just the way I like it! If you’re not wild about pumpkin pie spice, feel free to reduce it. So what are you favorite make-ahead Thanksgiving recipes? My planning has only gone as far as the most important element – dessert. 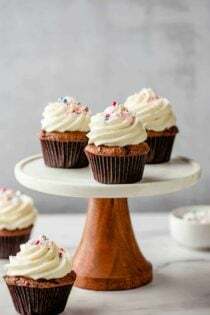 Looking for more gluten-free holiday desserts? Be sure to check out these Gluten-Free Pumpkin Pie Streusel Bars and these Gluten-Free Mini Caramel Pecan Tarts. If you haven’t already, you’re definitely going to want to whip up a batch of my Homemade Pumpkin Pie Spice! Note: If you need these cheesecakes to be gluten-free, make sure all your ingredients are certified gluten-free. Preheat the oven to 350°F and line a muffin pan with 12 muffin liners. Note that this crust recipe does not work in regular pie pans and only as mini cheesecakes. In a large mixing bowl, mix together the sugar, flour, cocoa powder, and salt. Using an electric hand mixer, beat in the butter at low speed until thoroughly combined and a dough forms. If you have trouble incorporating it, use your hands. It’ll be sticky. Divide the dough between the muffin liners (I used 19 grams of dough per liner). Press the dough down with the bottom of a shot glass. If using gluten-free 1-to-1 baking flour or all-purpose flour, bake for 11-13 minutes or until the surface of the crust no longer appears wet. Move on to the next step. If using buckwheat, bake for 14 minutes. The crusts will appear very bubbly and liquid. Remove from the oven, let cool for a minute, and then use the shot glass again to lightly press down (which will remove the holes). After baking, the crust will still be soft but will firm slightly as it cools. Let cool for 10 minutes while you prepare the cheesecake. Turn the oven down to to 325°F. With an electric hand mixer, beat the cream cheese at medium speed until light and fluffy. Add the brown sugar, granulated sugar, molasses, pumpkin puree, vanilla extract, salt and pumpkin pie spice and beat on low until well combined. Add the eggs one at a time, beating on low after every addition until thoroughly incorporated. Do not over mix! Fill each muffin liner to the top with cheesecake batter and bake for 20 minutes or until the middles of the cheesecakes are set and don’t jiggle when the pan is tapped. Remove from the oven and let the cheesecakes cool in the pan. Once completely cool (about 1 hour), remove the cheesecakes from the pan and refrigerate for at least 2 hours or until ready to serve. The wrappers come off neatly before and after refrigeration. Refrigerate the cheesecakes in an airtight container for up to 3 days. Let cool for about 20-30 minutes or until room temperature before pouring over the chilled cheesecakes. Since I’m not from the US we don’t celebrate Thanksgiving, but these sound delicious and I would love to try them out. I would never have thought that you can freeze them, it’s great. I love that you use buckwheat, I’m not intolerant to gluten, but I love its flavour. These look completely addictive, and they’re mini so that means less calories right? Yum, perfect for Thanksgiving! Would almond flour work in place of the buckwheat flour? I don’t think so as almond flour isn’t really interchangeable with anything else. These gluten-free mini cheesecakes have an almond flour based crust, though! You could use that crust recipe and add some cinnamon and ginger. Love the flavor of pumpkin and chocolate together. These are so cute – company worthy! Thanks, Karen! It was my first time mixing chocolate with pumpkin. I don’t know why I was so hesitant to try! Erin, I felt like I was reading words that I had written! Thanksgiving is absolutely my favorite holiday by far! So much less stress (and drama) than Christmas!! AND I’ve been on the hunt for make-ahead recipes because I learned last year that not everything can be made in the 5 hours before your guests arrive! Duh :) LOVE these mini cheesecakes, they are perfect for our upcoming Friendsgiving and our “real” Thanksgiving, thank you!! Haha. Yes! Exactly. I’ve also started asking people to bring stuff rather than make all 14 dishes by myself in one small oven. All perfectly timed, of course. ;) Thanks for your comment! I’m happy I’m not alone in the Thanksgiving love. 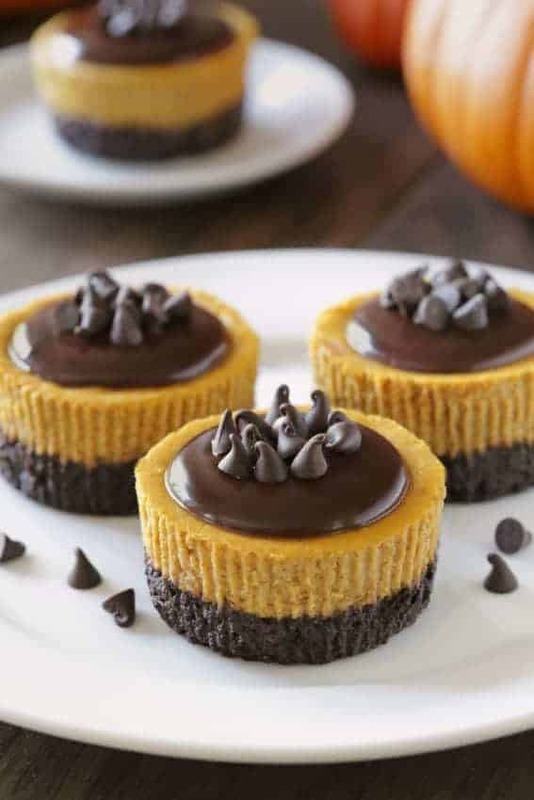 These mini pumpkin cheesecakes are adorable and stunning! I looove that they can be prepared in advance… although I will probably just end up eating one (or 3) a day like you and they will be long gone before Thanksgiving arrives! 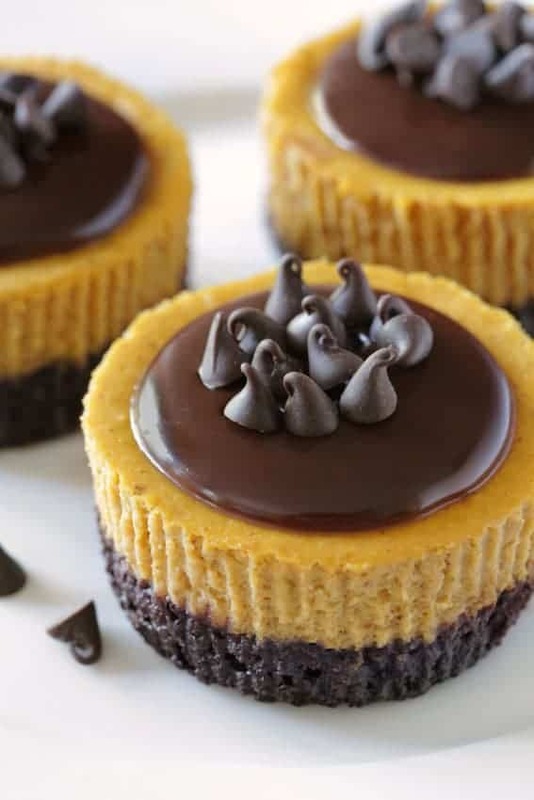 The chocolate cookie crust and the ganache sounds perfect with the pumpkin cheesecake! Pinned! Cheers and thanks for sharing the yum! If only the freezing desserts thing worked when it comes to self-control. Unless they’re really buried down in there deep, they just call my name every time I walk into the kitchen. ;) Thank you for your comment and for pinning! These look great. So you think they would work in a mini cheesecake pan as well? Thanks! I don’t have a mini cheesecake pan so I’m not quite sure if the molds are a little bigger or smaller. If you try it, just keep a close eye on the baking time. When they no longer jiggle in the middle, they’re ready. I hope you’ll enjoy them! What size can is the pumpkin puree? You only need 1 cup so the smaller 15-ounce (about 1 3/4 cups) can will do. Hope you’ll enjoy the cheesecakes! I used a regular Wilton muffin pan. Sorry for the confusion! I’ll add that to the recipe. I hope you’ll enjoy the cheesecakes! So, I line a 12-muffin tin with paper or foil muffin liners. If I am going to make these,tonight for thanksgiving, should I wait to make the ganache and put on top. I have never made ganache, so I just am not sure. Or can I make the, ahead of time, and do everything before and store in fridge until thanksgiving? Also, are those mini morsels on top? Can you freeze them with the ganache on, or does it need to be applied just before eating? I think the best thing to do is to freeze them in their wrappers, unwrap and pour some ganache on top before serving. You can also freeze them with the ganache on them but they’ll likely sweat a little as they’re defrosting. I hope you’ll enjoy them! these are a delicious decadent little bite. i made these for thanksgiving and they were a hit. since i don’t eat any kind of flour, i used my flour-less chocolate cake recipe in place of the crust. the ganache added that extra yummy something that pulled the whole treat together. thank you for a wonderful new addition to my holiday tradition. I’m so happy that you enjoyed the cheesecakes! Your crust sub sounds delicious. :) I’ve never tried anything like that but it sounds like I should. Thanks so much for your feedback! Hi, Vidya! I hope you enjoy them! I made these and they were really good. The only thing I noticed is that in the directions, it doesn’t state when to add the pumpkin pie spice. I assumed you add it as you are adding the remaining ingredients prior to adding the eggs. I hope that was right, lol. Great recipe and not too sweet. I am so excited to try this for dessert for our Christmas dinner! I was wondering if omitting the molasses would make much of a difference? I have an old bottle of molasses but am not sure how safe it is to use so would rather not use it. Obviously, I don’t use molasses much and would hate to buy a whole bottle! Thanks for sharing this recipe! You can omit the molasses! It’ll just taste a bit lighter. I’ve used molasses years after buying it and have never had an issue with it. I guess it keeps well since it’s basically just sugar. :) I hope you’ll enjoy the cheesecakes! Hi Jen! You use 6 tablespoons of any of the listed flours. So if you want to use AP flour, just use 6 tablespoons of AP flour. :) Hope you’ll enjoy them! Erin Is there another bottom crest you could use don’t care for chocolate. What kind of Cocoa powder do you use, “Natural” examples are Hersheys Cocoa or Ghirardelli or “Dutch Processed” ? Hi, Dieselle! Hershey’s and Ghirardelli unsweetened cocoa work wonderfully in this recipe. I hope you enjoy it! Thank you Erin for responding so quickly. I am making this as we speak, very excited to taste them. :D WIll do a follow-up after we enjoy! Thanks for sharing the recipe! In the oven now, what can I do with the extra cheesecake batter? I have small ramekins, do you think I can fill them and bake without a waterbath? What oven temp do you suggest? That’ll definitely work! You can put them in the oven with the mini cheesecakes. Can’t wait to hear how you like them! Decieded to make mini cheesecakes, sans chocolate bottom, will top with the ganache. Let you know how they turn out. How does this recipe translate to the cheesecakes in a 3″ diameter size with six per pan? Sounds delicious. I have celiac so it would work along with your Mini-Cheesecake recipe. Hi, Sue! Are you wanting to half the recipe? Let me know how I can help!